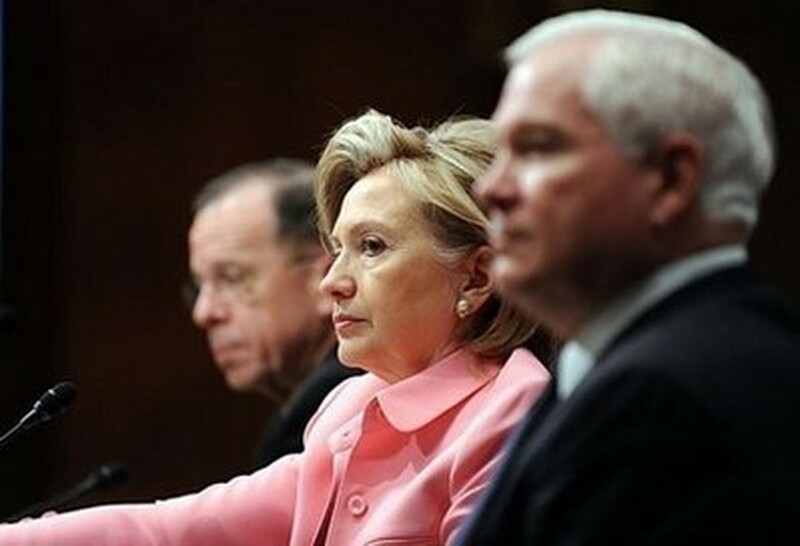 US Secretary of State Hillary Clinton (centre) alongside Chairman of the Joint Chiefs Admiral Michael Mullen (left) and Secretary of Defense Robert Gates (right) in Washington, DC. The United States has introduced a draft resolution at the UN to slap tough new sanctions on Iran, fast on the heels of what it cast as Iran's bid to stall efforts by signing a nuclear swap deal. 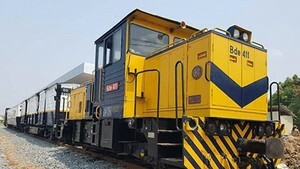 The draft resolution would expand an arms embargo and measures against Iran's banking sector and ban it from sensitive overseas activities like uranium mining and developing ballistic missiles, a US official said. "The resolution would establish a comprehensive new framework for cargo inspections, both in states' ports and on the high seas," the official told journalists on condition of anonymity. The draft, which was being debated by the 10 non-permanent members of the UN Security Council on Tuesday, had received the blessing of all the veto-wielding permanent members, including the usual standouts China and Russia, the US said. "We have reached agreement on a strong draft with the cooperation of both Russia and China," US Secretary of State Hillary Clinton said. "This announcement is as convincing an answer to the efforts undertaken in Tehran over the last few days as any we could provide," Clinton told the Senate Foreign Relations Committee in Washington. She was referring to Monday's deal, brokered by emerging powers Brazil and Turkey, in which Tehran agreed to swap much of its stockpile of low enriched uranium (LEU) to Turkey in exchange for fuel for a research reactor. Beijing's apparent backing of a fourth round of sanctions against Iran over its suspect nuclear activities came despite its earlier support for the swap deal. "We attach importance to and support this agreement," Chinese foreign ministry spokesman Ma Zhaoxu said. Western powers fear that Iran's atomic program is a cover for a nuclear weapons drive. Tehran denies this, saying the program is aimed at peaceful energy use, which it insists it has the right to pursue. Clinton reiterated that Washington had raised "a number of unanswered questions" about the tripartite deal struck on Monday, but welcomed what she called the "sincere efforts of both Turkey and Brazil." For Washington, the core issue was that Iran intended to continue enriching uranium. US President Barack Obama meanwhile met for 90 minutes with Jewish lawmakers in Congress to discuss the draft resolution and brief them on the Iran nuclear issue, as well as on Israel's security situation and prospects for Mideast peace. There was no immediate reaction from Tehran and it was unclear what effect the draft resolution would have on Monday's accord which commits Iran to deposit 1,200 kilograms (2,640 pounds) of LEU in Turkey in return for fuel for a Tehran research reactor. Turkey and Brazil are both non-permanent members of the UN Security Council. Brazil's Foreign Minister Celso Amorim insisted in Brasilia that the new agreement "creates an opportunity for a peaceful negotiated settlement." Amorim did not discuss the US move explicitly but warned that ignoring the new situation "could lead people to grave situations, and trigger escalating reactions." Turkish Prime Minister Recep Tayyip Erdogan urged the world community on Tuesday to support the deal, which his foreign minister, Ahmet Davutoglu, warned could be spoiled by talk of sanctions. But French President Nicolas Sarkozy, whose country along with Britain rounds out the Security Council's permanent membership, said that while it was a "positive step," the deal must be accompanied by a halt of Iran's uranium enrichment. Tehran said Tuesday that it expects a swift response from world powers on the accord, which a government-owned newspaper boasted had "checkmated" US efforts for new sanctions. Iran would notify the International Atomic Energy Agency of the accord "in writing, through the usual channels, within a week," foreign ministry spokesman Ramin Mehmanparast said. In October, the Vienna Group made an offer for Iran to ship most of its LEU out of the country in return for higher grade reactor fuel to be supplied by Russia and France. Iran stalled on the deal, insisting it wanted a simultaneous swap on its own soil, a proposal world powers rejected. Tehran, already under three sets of UN sanctions over its defiant nuclear drive, touted the agreement as a goodwill gesture that paves the way for a resumption of talks with world powers. Iran's enemy Israel -- the Middle East's sole if undeclared nuclear-armed state -- is weighing a formal response to the deal, although a senior official accused Iran of trickery shortly after it was signed.